All members have the right to vote for District Directors by ballot at the meeting or by mail-in proxy prior to the meeting. Watch for the direct mailing of the proxy and the Annual Meeting notice listing time, date and location in The GVEC Review and your local newspaper each year in June. In addition to the director-election, the Annual Meeting includes a presentation on the state of the electric industry as well as GVEC business. All members enjoy complimentary refreshments, entertainment, and door prizes. View the GVEC Annual Report detailing Cooperative business for the previous year. It is distributed to all attendees of the meeting and posted online along with our Annual Meeting video after the meeting for all to view. Watch our Annual Meeting Video, below. 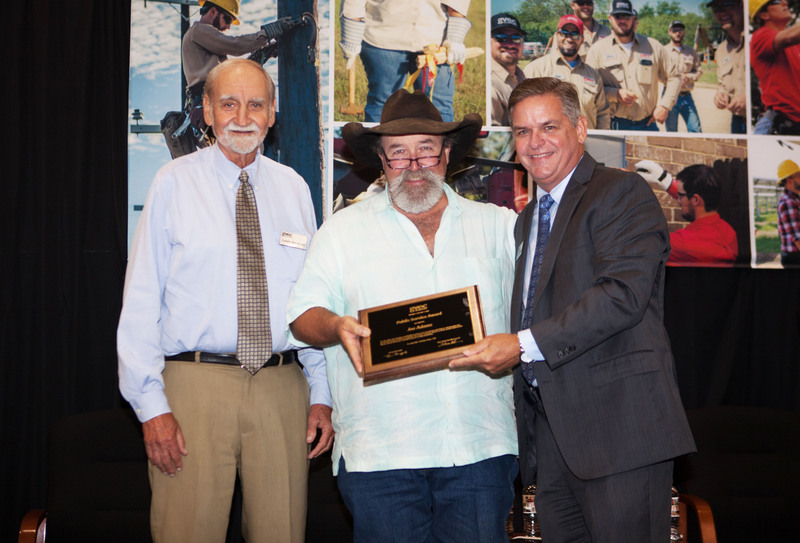 Joe Adams of Cuero receives the 2018 GVEC Public Service Award for an individual for his service to community and the impact he has made on his community’s residents, businesses and projects. From left: GVEC Board President Lewis Borgfeld, Joe Adams, and GVEC General Manager and CEO Darren Schauer. The Wade Busby Memorial (WBM) receives the 2018 GVEC Public Service Award for an organization. 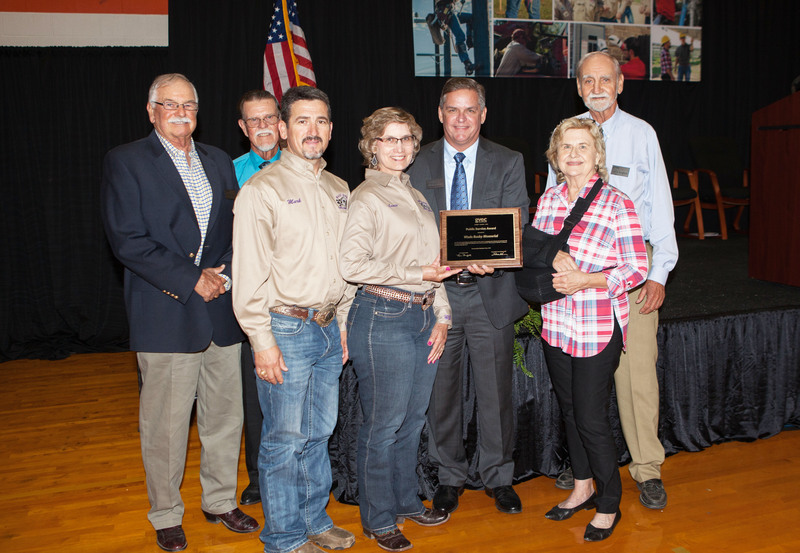 GVEC selected WBM as the 2018 organization PSA winner for its huge impact in promoting and expanding agricultural education in Guadalupe County—the very lifeblood of GVEC’s rural service area. From left: GVEC Board Secretary/Treasurer Don Williams, GVEC Board Vice President Melvin E. Strey, Wade Busby Memorial Board Member Mark Cerda, Wade Busby Memorial Board Member Laurie Leach, GVEC General Manager and CEO Darren Schauer, Wade’s Mother Darlene Busby, and GVEC Board President Lewis Borgfeld.